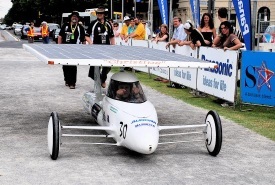 The Aurora Vehicle Association Inc. has been building solar cars since 1987, and in that time has built a number of different cars. The team is fortunate enough to currently have in its possession four cars which represent one car from each generation designed and built by Aurora. Aurora Evolution is Aurora's current lead car, and is our primary competition and show car. 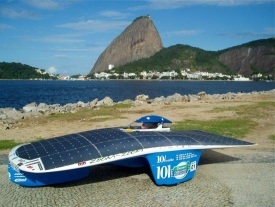 Originally built in 2005/2006 to replace a car lost to fire in Spain, Aurora Evolution is among the fastest silicon-powered solar cars in the world, and is constantly subject to upgrades ensuring it remains at the forefront of solar car racing and uses the best technologies available. 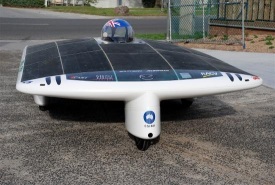 Built in 1991 Aurora Q1 represents the first front wheel drive, suspended body car built by Aurora, Aurora Q1 is showing the signs of age and is currently undergoing a major restoration with the intent of allowing it to carry out light running duties and to be shown as an evolutionary step in Aurora solar car development. Built in 1987 Christine ran in the first ever World Solar Challenge, In 2006/2007 it received a major overhaul to allow it to compete in the 20th anniversary run of the World Solar Challenge, the car is of the pod and wing design and is therefore unique among the Aurora Vehicles. Despite the car's age it is regularly used by the team for static display, and can be restored to operational status if required.